Mahindra KUV car was first launched in 2016 but did not receive the popularity Mahindra would have liked. As a result, the company worked on user reviews and got out it with an iteration of the first generation and named it as KUV100 NXT. Though Mahindra KUV100 might appear as a compact SUV, it is best described as a hatchback. With the addition of several premium features and more attractive and sharp styling, KUV100 NXT will surely catch more eyes than what it used to earlier. Does this car have what it takes to attract customers to the showroom? Let us find out. The above prices are Ex-Showroom. Mahindra KUV100 NXT returns a mileage of 18.15 kmpl for Petrol and 25.32 kmpl for Diesel. The car is only available with a 5-speed manual transmission. The new KUV100 NXT borrows the same engine configurations from the pre-facelifted version i.e., a 1.2 litre petrol engine producing 82 HP and 115 Nm torque and a 1.2 litre diesel engine producing 77 HP and 190 Nm torque. Both the engines are from the mFalcon series. Being a 3 cylinder engine, the refinement is on the lower side compared to the 4 cylinder hatchbacks such as Baleno, Swift, i20 and Figo. Due to softer suspension, most of the uneven surfaces are tackled with ease at lower speeds but at higher speeds, the effect of uneven roads is more especially at the rear. The transmission is very smooth and the gear joystick is easy to operate. The steering is big and heavy and will have a real test during parking. All in all, the performance of KUV100 NXT is not what a car enthusiast would enjoy. Mahindra KUV100 NXT is available in two engine configurations:- a 3-cylinder 1.2 litre petrol engine producing 82 HP and 115 Nm torque and a 3-cylinder 1.2 litre diesel engine producing 77 HP and 190 Nm torque. Both the engines are from the mFalcon series. Both the engines have good throttle response but the heavier weight of the car leads to a constrained response from the engine after reaching 100kmph. The location of the 5-speed manual gearbox may appear awkward to most of the buyers but that is not the case. In fact, the joystick gear lever is easy to reach. Changing gears is very smooth, unlike other Mahindra cars. The company hasn’t provided an automatic transmission for KUV100 NXT yet. Mahindra hasn’t changed the design a lot, but the changes that have been made have resulted in the design is much less quirky than what it used to be before. The new aggressive front grille, muscular front bumper with silver skid plate and flared wheel arches with a wheel, door and sill cladding have lifted up the design by quite a margin. At the rear, double-barrelled clear lens tail lamps, an integrated spoiler with aero corners and muscular body lines enhance the car’s look. The beautifully crafted diamond-cut 2-tone alloy wheels also look very attractive. The tyre size does look a tad smaller. Overall, the exterior design of the car is very refreshing. Once you step into KUV interior, you would be surprised by the space on offer. There are adequate headroom and knee room. Three people sitting at the back will find themselves comfortable though three at the front should not be seated, the middle row seat is cramped. Piano-Black insets and silver accents on the dashboard lend a premium touch to the interiors. The location of the gear lever is not a problem as you are more likely to get accustomed to it in the long run. The 7’’ touchscreen infotainment system, equipped with GPS, Navigation and Bluetooth is one of the biggest additions in the interiors and has an excellent response on touch. Sporty black interior theme is much better than the grey, that was present in the earlier version. Several storage spaces have been provided such as sunglass holder, cup-holders, cooled glove box, under-seat storage, under-floor storage and bottle holders. Different in appearance from other hatchbacks have some SUV design elements. The gearshift is very smooth and easy. A 5-speed manual is fun to drive. ABS and EBD standard across all the variants. Dual airbags available from K2+ variant. Equipped with a decent list of features. Generous cabin space, especially at the rear. Design not to everyone’s taste. Some prefer conventional hatchback styling. Average ride quality, scope for improvement. Average NVH levels, noise creeps inside the cabin. Lower range limited to city drives. There is a lot of space for improvement here. Better options available in the market such as Grand i10. Q. Is KUV100 NXT the best car ever from Mahindra? A. 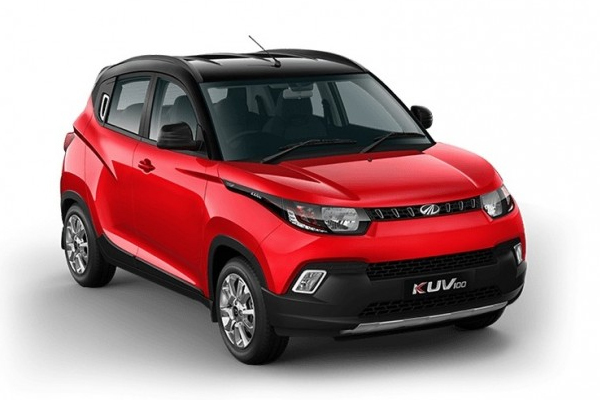 All the other cars from Mahindra are much more expensive than KUV100 NXT. It still requires improvement in certain departments. Q. Is there any benefit of the middle seat at the front? A. It is best suited to kids only as it is quite cramped to seat adults. Q. Which is the best variant to buy? A. There is a difference of around ₹ 50000 only between K6+ and K8 variant. It is recommended to go for the top end variant if you have the budget. Q. Does KUV100 NXT get a manufacturer warranty? A. Enjoy peace of mind with a standard warranty of 2 years/unlimited km. Extended warranty available for up to 5 years. Mahindra KUV100 NXT might not appear to be a conventional hatchback because of its SUVish appearance but it has nearly the same features as a hatchback and also falls in that price range. With KUV100 NXT, Mahindra has brought something fresh to the table, but competition in this segment is quite high. As a result, you have to be at your absolute best to stand a chance to get noticed. Though this car has the appearance, space and comfort and smooth transmission but it lacks in drive quality, noise insulation, has a heavy steering and a 3-cylinder engine opposed to other cars in the competition. This car will definitely keep those buyers interested who are in the search for a budget family car as it is the only car to offer space to carry six passengers on board. You can book a test drive of KUV100 NXT here. If you wish to buy Mahindra KUV100 NXT, you can book it online for just ₹10,000 at Mynewcar. Mahindra is a major homegrown car manufacturer and is also the third largest car manufacturer in India. The other car models available from Mahindra are:- Alturas G4, Bolero, Scorpio, eVerito, XUV500, TUV300, TUV 500, e2oPlus, Thar and Marazzo. You can get more details on these models at www.mynewcar.in. You can check out the review of Mahindra Marazzo here or check out the review of Mahindra Electric Car, e2oPlus. India’s largest Utility vehicle (UV) manufacturer, Mahindra has plans to launch some amazing vehicles in the first half of this year. These include XUV300 (expected launch date:- 14th February 2019), XUV700 or Inferno (expected launch date:- March 2019), eKUV100 (expected launch date: Mid 2019) and TUV 300 facelift (expected launch date: May/June 2019).